This is about as simple as healthy meals get! Make this 1 healthy slow cooker chicken recipe and then serve it 5 different, delicious ways! I’m so happy you are here to find out more about one of the easiest slow cooker recipes ever!! Before we talk more about how to make it and all the yummy ways I like to serve it, I wanted to offer you my newest eCookbook totally for FREE! 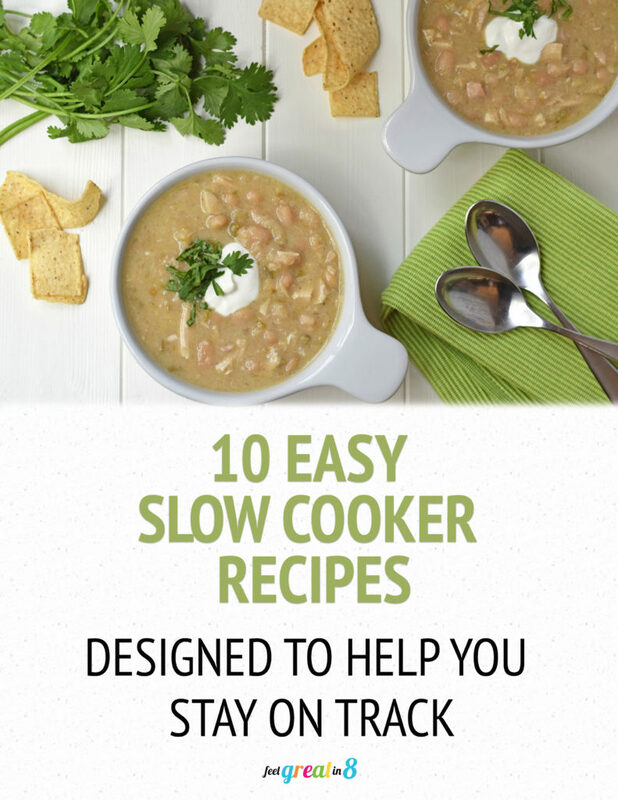 I collected 10 of my favorite healthy slow cooker recipes (including this recipe, a recipe for Honey Garlic Chicken & Veggies, White Chicken Chili, and Beef & Broccoli!) and I just know you are going to love them! Now that you’ve requested your free eCookbook, let’s get to how to turn one easy slow cooker recipe into 5 meals! I know you all have those weeks where activities, meetings, and responsibilities have you running like crazy! THIS healthy slow cooker chicken recipe collection is the solution! It takes literally a few minutes of prep on Monday to make a big batch of this Salsa Chicken in the Slow Cooker. Then, with a few tweaks, you can turn that one recipe into 5 different meals for you and your family! First, start with this recipe for Ridiculously Easy Salsa Chicken in the Slow Cooker. If you have a big family or older kids, you can double the recipe. NOTE: Make sure you use a big enough (6 or 7 quart) slow cooker for a big batch of the chicken – I have one of the cheap Manual Crock Pot Slow Cookers that works great! Then, just mix-it-up each night for dinner, or on a few afternoons for lunch! To save even more time, you can go with store bought tortillas. I love the Tortilla Land uncooked tortillas when I don’t do homemade. 1. Use it as a filling in Homemade Corn Tortillas or lettuce leaves with a little avocado, cheese and sour cream. 2. Serve in Baked Mini Taco Salad Bowls for a fun dinner for little hands! 3. Salsa Chicken Salad – Top lots of greens with the salsa chicken and Homemade Baked Tortilla Strips – this is one of my favorite lunches! 4. Create a tasty rice bowl with this quick and easy Cilantro-Lime Brown Rice. 5. Use the salsa chicken as a topping for Mexican Pizza, or as a filling in cheese quesadillas with Whole Wheat Tortillas. ENJOY! And don’t forget to get your free ecookbook! « $500 Amazon Gift Card Giveaway!! 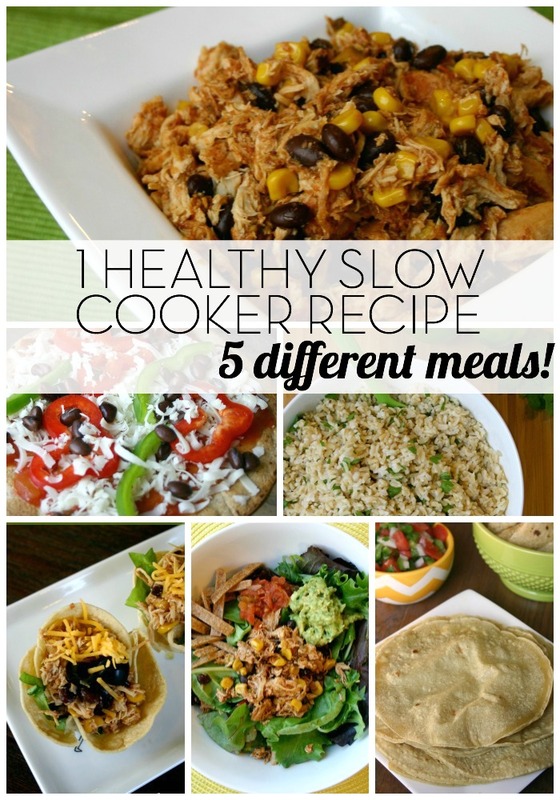 My 10 BEST Healthy Slow Cooker Recipes! I hate spam and promise to keep your info safe!